The recent deal between German utilities RWE and Eon will lead to a concentration of power in the different segments of the energy market, writes Marius Buchmann of Jacobs University in Bremen. According to Buchmann, the big question is whether the new companies will become innovation engines or will impose new market entry barriers. Article courtesy of Buchmann’s blog Enerquire. Since 2016, the largest German utilities, which happen to be major international players in the European energy market as well, have been in a strategic transition period. What happened in 2016 is that Eon and RWE separated their conventional generation business from network, retail and renewable business units. For RWE, Innogy became responsible for renewable generation, distribution networks and the retail business. RWE itself, on the other hand, focused its business on conventional generation. In the case of Eon, a new subsidiary, Uniper assumed the task of conventional generation, while Eon itself kept the distribution grids, the renewable generation business and retail solutions. In this post here, we analyzed in greater detail the different drivers for this strategic shift in 2016. Most importantly, the separation of renewable and conventional generation seems reasonable because an investment in renewable generation cannibalizes revenues from conventional generation via reduced operation hours and lower prices at the spot market. This threat of self-cannibalization makes it difficult to develop a renewable generation portfolio within a company that depends on revenues from conventional generation. In this post, we discussed the potentially disruptive nature of renewable generation for the conventional generation business. On 12th March 2018, both Eon and RWE announced that they will exchange resources to form two more focused companies. Eon will sell its renewable generation business to RWE and will in exchange receive the network and retail business from Innogy. The details of the proposed deal between Eon and RWE are specified in Figure 2. For Eon, selling its renewable generation assets will result in a stronger focus on regulated incomes from network operation. 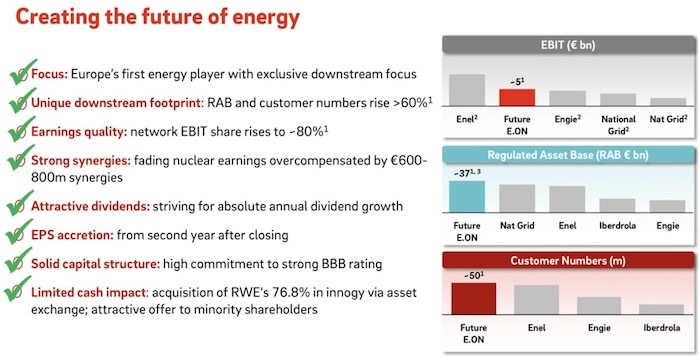 Today, Eon’s EBIT is based 65% on regulated earnings, mainly from the networks and partly from renewable generation. The new Eon will increase its regulated asset base from € 23 billion in 2017 to € 37 billion, which equals an increase of 62%. 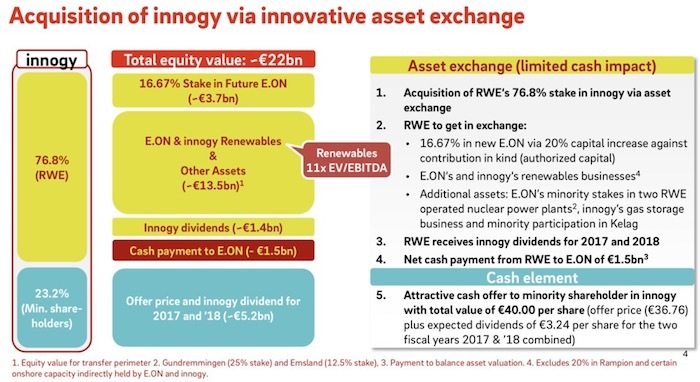 With the networks from Innogy, the new Eon will potentially derive 80% of its EBIT from regulated earnings. At the same time, the customer base will increase from 31 million to 50 million customers – again an increase of 62%. Figure 3 shows how the new Eon relates to other major players in the European energy market. Several reasons come to mind why Eon chooses to focus on the regulated business in combination with the consumer segment. From our point of view, this strategy primarily aims at risk reduction. While renewable generation is a regulated business, this is likely to change in most European markets soon. Even today, due to decreasing subsidies and increasing competition, revenues from renewable generation are falling. At the same time, competition in the consumer segment is increasing. With digitalization, it is likely that competition in existing and new markets (such as smart homes) will intensify soon. Reducing the risk by focusing on one of the competitive segments (renewables or retail) might therefore be a reasonable response. In the consumer segment, both Eon and Innogy have concentrated on similar markets, which offers the potential for synergies. Furthermore, Eon and Innogy have invested money in the development of new innovation processes (e.g. both make use of innovation hubs and accelerator programs) that aim at developing new digital business models for utilities. While this is a rather new business area for energy utilities, Eon and Innogy share the vision that digital consumer solutions rather than generation should become the focus of energy utilities in the future. RWE – an even bigger dinosaur? In contrast to Eon, RWE specializes in non-regulated earnings from conventional and renewable energy generation (which will become non-regulated earnings in the near future). The new RWE will become an even larger player in the conventional generation business than it is today, by gaining Eon’s shares in nuclear and gas power plants. Today, RWE receives roughly 65% of its total earnings from generation. This share will increase to 90% after the deal with Eon has been closed. In addition, RWE will gain all renewable generation capacities from Eon. Together, the new RWE will then own 8 GW of renewable capacity in total. As a result, RWE will operate the second largest renewable generation portfolio in Europe. Still, compared to the conventional generation of 46 GW, renewables will play a minor role at RWE. The interesting question will be how RWE will deal with the risk of self-cannibalization. Investing in renewables results in decreasing earnings from conventional generation. So far, experience from the last decade has shown that RWE will rather focus on conventional generation than actively shape the energy transition. In general, the deal will lead to a concentration of power in the different segments of the energy market. RWE will gain significant market power in the generation business, while Eon will be very dominant in the consumer and network segment. While the network segment is regulated, the consumer segment is not. Therefore, regulatory authorities might oppose the proposed restructuring of the two energy giants. If the deal is closed, Eon will gain a powerful position, especially when it comes to the development of new consumer services. Whether these new services are data-driven or not, in order to sell products, it is always a competitive advantage to have an established connection with existing consumers. Especially in the context of energy consumption, most private households have not made much use of competition so far. Switching rates in Germany and other European countries are rather low. Therefore, once a utility has won a customer, it is quite unlikely they will switch to another competitor. Though this might (hopefully) change in the future with more digital products entering the energy realm, it puts Eon in a better starting position compared to its competitors. First of all, we need to take into consideration that large utilities are only minor players in energy transition. All utilities together own less than 15% of total renewable capacity in Germany. Although in this segment RWE would gain a significant role after the restructuring – it would be the largest utility investor in renewables in Germany, especially in on- and offshore wind – RWE will not be able to determine how the energy transition evolves. However, when it comes to conventional generation, after the restructuring RWE will own even larger shares in Germany, which gives this company more market power and political weight when discussing the future of energy production in Germany. Whether the government will listen to RWE’s positions remains to be seen. But it seems certain that RWE’s ability to influence politics related to the energy transition might increase after the deal. On the other hand, the energy transition strives to develop an energy system based on decentralized generation and distributed flexibility. Especially the latter requires new solutions and services that unlock the flexibility potential of all user groups: industrial, commercial and residential. Here, the merging of Innogy and Eon might lead to more innovative solutions that support the energy transition on the consumption side. But only if Eon implements innovation processes and builds cooperation with other innovators to develop successful services and products in the retail realm. This is questionable as consumer-centric innovation has not emerged as a strength of German utilities so far. In addition, the new Eon is certainly not smaller and hence less likely to adapt fast to changing environments. It seems clear that both Eon and RWE strive for market power to address the challenges of increasing competition and decentralization. Whether this strategy will be successful remains to be seen. For those of us who favor the benefits of decentralization (higher shares of renewables, less market power, product differentiation, resilience etc. ), the centralization targeted by Eon and RWE might be a step in the wrong direction. In our opinion, it is less important how RWE proceeds with the generation business since this business model is focused on conventional generation which does not offer any solutions for the overall challenges from climate change. More importantly, we should observe how Eon uses its market power: Will it evolve into an innovation engine for energy transition or will it impose market entry barriers for those innovators that strive to make decentralized the energy transition a success? Marius Buchmann holds a Ph.D. in energy economics and works as Post Doc at Jacobs University in Bremen, Germany. He writes about energy on his blog Enerquire. 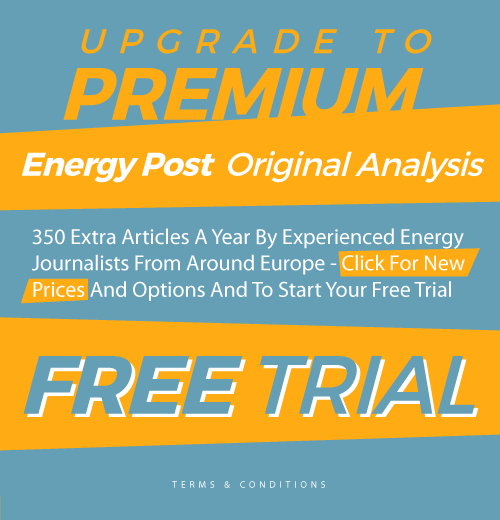 This article was first published on Enerquire and is republished here with permission.